This is the final post for a few weeks, and I thought it appropriate to reiterate my aims (slightly changed) from the beginning of this blog, 11 weeks ago. We undertook these blogs for a purpose, to gain something and to show the process of that development. I definitely feel I have achieved, or at least made a firm dent in, that purpose. The first five weeks were a process of near-constant researching and writing. Around week eight I had a breakthrough in the studio, followed quickly by something ‘clicking’ in the work in week ten. These shifts in studio perception have led to the beginnings of a change in focus. At the moment that change seems subtle, and more of a development than a transfer. For now, this change affects my aims and objectives as follows. My aim is to explore the ways art is experienced and understood, through a combination of engaged theoretical research and perceptual process, to underpin a research-led practice that aims to question the ways we look at art and our underlying assumptions, specifically in regards to the effects of painterly language and spatial presentation of ‘Art’. My objectives can be grouped into an interest in the physical and metaphysical experience of art in relation to (1) creation and the artist's process (2) curation and the viewer's experience and (3) the space (or context) that underpins and intersects them both. While this seems like a broad subject I've come to realise that there are specifics found in the studio practice. I am interested in creation (1) for its influence on the subject matter and materials in my work. Curation (2) is of interest in terms of presentation and understanding experience, and space (3) is, in this case at least, defined as both context and material, which I attempt to combine in the studio. I'm not totally confident that this articulation is the best one at the moment, but the next part of this module is an essay exploring this articulation in further detail. So it’s best, to avoid plagiarising myself, to save that articulation for later. This, final update, has encouraged me to begin re-writing my statement. The re-worked statement can be found in the ‘about’ section of my website and I feel it sits far better within the scope of my work, and the wider context. I had plans to list here, under a variety of headings, all of the research contained in this blog. As if this, in some small way, validates the decisions I have made in the subjects I have researched. I have come to realise that this is a, somewhat, pointless exercise. The validation is not needed, and the list only serves to lower my anxiety. Here is a simple diagram instead. This covers the research done in the last 11 weeks. Other avenues of thought (such as the note/thought sections of this blog) and seemingly unrelated research has fed into a wealth of contextual knowledge that I have been workingwith in the studio. The practical application of this research is hard to verbally quantify but the works speak for themselves, that is, after all, what makes art distinct from philosophy. I have written or at least written first drafts of, a few posts that I haven’t posted online. I plan to finish these while continuing with further research. These include; Deskilling, Dianna Molzan, Sandra Gamarra, Phillyda Barlow, Haim Steinbach, Bruce Nauman, De-aestheticisation, Performance art, and Anti-art. We have had to write an annotated bibliography covering this blog, and the research done within it. Choosing elements to annotated was probably the most difficult part of this assignment. The purpose of the bibliography is to show the breadth of sources, engagement with them and the implications of them in our practices. This has been hard to quantify. How can we show the impact of research? How can we annotate whole books into a few sentences? and how can we communicate the subjective reality of the impact these sources have had, against an attempt at an objective perspective. I have chosen my sources, annotated them to the best of my ability at this time, and I hope that it shows what I am researching and why. As the assessed time of this module draws to a close, it’s a time for a deeper reflection. The next steps of this process is a written essay exploring my methodology and a presentation outlining future goals and aims. In aid of this ongoing exploration, I wanted to take a moment to reflect on the act of keeping this blog. This has been an entirely new experience. I have recently finished my BA, during which we had to create a context folder, containing evidence and articulation of research done during our practice. My natural inclination has been towards research, and it has been an integral part of my practice for the last four years. BUT this has always been a solo process, only existing as a final form towards the last term of the year as I worked to pull everything together. This, more refined, process has been interesting and has highlighted some of the assumptions about research that I had fallen into. My referencing skills have improved since starting this module, and I've come to appreciate the value of referencing from the start of research. This is something I will definitely be taking forward, and a useful function of the blog. Keeping the blog has encouraged a consistency of format throughout my posts, and has encouraged me not to linger too long on a single point. The academic level is higher than I have achieved (over a sustained period) previously and I can honestly say that I have thoroughly engaged in this process. My skills in referencing, articulation and language have improved in the weeks since I have started this blog. I have resisted the urge to go back and edit too much, to correct for this improvement, as I feel it shows an honest view of research in practice. A constant process of development. Writing with the knowledge that it is in the public realm has altered the way I write, or maybe it would be more accurate to say that it has altered the way I see my writing. Writing is a creative practice, and I’ve been thinking about writing as more of a tool for research rather than record (which I plan to discuss more in my essay so shall stop here for now) and the blog has been the primary reasons for that train of thought. This module has been an eye-opening experience, one that has shown me a new perspective on the things I have researched, and in the way I research. The layout of this blog, along with the annotated bibliography, essay and presentation, encourage a heightened level of self-reflection. It has been anxious, and tiring, process but an extremely useful one. I debated, for quite a while, about whether to include a note to the length of this blog, and the frequency of posts. It is reasonable to say that I have been fully engaged in this process, my life has revolved around this research process, studio working and contextual discussions. There is a lot here, but that does not imply efficiency in a negative sense (rushed, or done without depth) but an engagement with the process in line with the requirements of this module, and with the expectation that the process will change, and research will become deeper into more focused subjects in coming months. The thing to note here, more for myself than anyone else, is that I have not worked with a sustainable practice this term. I have worked more than I should have, which accounts for how utterly exhausting I have found this process, which is something I plan to work on next year. For now I am content with the solid foundation of theory I have created here, that I know will be useful for years to come. The first few weeks of this term were a process of taking in information and getting to terms with the terminology and perspective of the module. The middle portion, the meat of the module, was taken up with an extreme engagement and was where the majority of blog posts were produced. I scheduled many, to allow for some space in the positioning of them, and for myself to come back to them before they were posted. The result of this is that the final few weeks have a higher frequency of posts. This to do with the posts I had written in the preceding weeks and scheduled for later. A well-organised plan, however, I did not account for the fact that inspiration for context has not stopped because I had reached the point where I had ‘enough’ posts scheduled. I have found that since that moment (which occurred about two weeks ago) there have been a vast array of things I've wanted to speak about and write about. I don't want to stop the passion I have for the research, and the work and I am not sure I could stop myself if I wanted to. So instead I have continued to write and research, and I have then been posting the most recent texts on the day I write them. So, the final few weeks are a combination of the completion of posts begun earlier and inspired research of the time. I have come to realise, through this, that I should have posted things as I finished them. Normalising the frequency of my research seems like something done to appear in a certain way. This will change in future. My general skills in researching have improved, separately from the blog. As I continue to practice researching, and gain more knowledge that aids in the understanding of the research being done. I’m beginning to realise knowledge has a slight exponential curve, the more you learn, the more you understand. Small improvements can be seen in practical research skills, like skim reading as a form of scoping out research, being able to quickly evaluate the value of information in relation to my practice. A form of tangential research that comes in line with an understanding of my own place within the wider context of the artworld. What - Art; an exploration of art theory and practice that questions what art is in our society, what it can do for us, and ways of perceiving art and space. A practice that hopes, beyond all else, to raise questions and encourage an active participation, mentally or physically. Where - University. This is a point worth noting. I am doing these things with the underlying knowledge that it will be judged, marked and assessed in line with institutional guidelines. While the course is definitely self-motivated, there are things we have to do. I would not be writing this blog if not for this course, and these words wouldn't exist. Clear evidence for the value of an MA in Fine Art. How - Through a process of presence and perception. Physically making the work and mentally exploring the ideas of others. A strong reflective stance, with a growing ability to perceive objectively and a growing foundation of contextual knowledge. At the sake of repeating myself, this is one of the main questions in the upcoming essay and presentation, so, for now, this answer will suffice. Why - This is the hardest of the honest men. Why do I do this? The honest answer, for an honest man, is that this is where my passion lies. I have a creative mind, and I enjoy challenging myself and others. I create art because I believe in it, and the transformative power it can hold, individually and on a wider scale. Who - Me. An optimistic art student, with a passion for knowledge and a tendency to overdo most things. My biases could be argued to relate to my gender, cultural context, financial status, marital status, class definition, educational history, mental perspective, philosophical outlook, and arguably many more. Those things are too personal to define on a blog but show through the writings and reflections found within it. The thoughts are often insightful, possibly because of the nature of the process, my mind is occupied and i'm totally alone, and would normally be lost in the act of driving. Reflective thoughts - This is the same format as the voice memos (recorded by date) done when not driving. I have a document saved on my phone, so that I can access it anywhere. This note was begun on that document, and most of the ‘Note/Thought’ posts are taken from this document. Having this document allows for notation of thoughts in a more inclusive way, which has shown the shear number of connections in thinking; in life, and in art. Research posts - This is the most traditional form of research. Taken from books and other sources. I prefer to take in information (with annotation where possible, so I photocopy or buy books that I can highlight and note in) and then summarise it later with my own thoughts. Research Methodology posts - These are places where I have explored the methodology itself, and it's terminology. Includes many reflections. Photography - Working with objects, in a perceptual practice, requires a form of documentation. In addition to written documentation I take photographs of my space and connections made in the studio. This is a vital part of my process and beginning to move into the work itself. An interesting note the duality in my work. Things seem to come in pairs or threes, I think this an important realisation and observation of myself as an artist, and my process. The frequency of posts is going to change, both as this module is assessed and as the nature of my practice changes in line with the MA and my attempt to balance work and life slightly better. The research will be ongoing but, over the next few weeks at least, I plan to spend the time writing my essay, and doing any extra research needed for that. My provisional ongoing plan is to go deeper into a few areas uncovered in this, first, stage as well as following a few links I didn't have time to follow. Reflecting on the blog, and presenting an output from research in this way has been very influential in itself, and I plan to continue, albeit with fewer posts per week (at this time I think I have averaged eight, which I will try to limit to two as I continue forward) as the year goes on. Research is coming more directly into my work. Referencing the act of research itself is something I want to explore more. Research can be both a definition of art and a vital part of the practice of it. I would like to explore both more inherently in the work I create. Evaluating the success of research, in artistic practice, is proving to be more difficult the further I get. These are the choices I have made, these are the things I have researched, and this is what I have done with it. Thank you for joining me on this journey so far. McGinn, A. (2017) Research Methodologies - Intro lecture - Knowledge - Useful terms and ideas / October 4, 2017. [Blog Post] Allymcginn.com. Avaliable from: https://www.allymcginn.com/research-blog/2017/10/4/new-beginning-research-methodologies-knowledge [Accessed 09.12.17]. In the reflection of my research on ‘The Sublime’, I described one of the ways I research. After a lecture by PhD student Lydia Harcrow I have realised the importance of articulating this method in itself. My work revolves around the importance of presence. As subject, medium and practice. The driving force for my work is my presence in the studio. The driving force for my research, as I have discovered, is presence in the metaphysical. In other words; just getting on with it, and working through it. (This is shown and defined by a realisation that writing is a tool for thinking, not simply as a record, a notion repeated throughout this blog) My subject is dependent on and explores the presence of the viewer, and the object, within the work. Another element of presence in the research is a method I rarely speak about. Every evening, without fail, I go for a walk in the dark around the fields near my home. During this time I either listen to research (through audiobooks and podcasts) or read research I have preloaded on my phone. This is the place where I write most of my thinking and process the research. I spend at least one hour outside and have been known to be out for up to six hours when writing. This is a time of being present, of embodying a thinking process where the majority of visual stimulus is reduced, external inputs are minimised, and the contextualisation of theories can be the sole focus. Presence, in artistic practice, can be seen as synonymous with embodiment. This embodiment comes from the objects we see in art, and the experience we have with them, but also from the artist's presence within the work. The studio practice is reliant on the embodiment of myself, and later the viewer, and this articulation is to show the importance of embodiment in the contextualisation of my practice. My evening walks, which happen even in freezing weather or rain, are a meditative process, that brings in an element of distance, from visual stimuli and other inputs. Time to reflect. This is a post about the notion presence in a part of my practice I had not associated with it. While not necessarily a research post, it serves as a note for myself about the recurring theme so far this year, and certainly throughout this module; presence. The title is ‘Through presence and process’. I believe what a title does is contextualises and places the work, as a whole. Titling in this way (as an extended experience) can be compared to the title of an exhibition, and resonates with my interests in an ongoing practice as art. These are important elements in my practice. This title has led to the reduction of my practice to two single keywords. I’m not entirely sure if this is positive, or entirely accurate, but it is certainly accurate to my best feelings at the moment. Bibliography - All of the words in this post are my own, but the desire to articulate this thought was inspired by the following lecture. Whiting, M. Southall, A. Harcrow, L. (2017) Research Methodology Lecture Series. Bath Spa University. 5th December 2017. Ally McGinn (2017) Documentary photograph of walk. Portholland, Cornwall. 01.12.17. We had the MA open studio’s last night and it was the first time we have all shown work together, and for many the first time, we had seen each other's work. There are some extremely talented people on the course, and it was a very interesting evening. Inspired by the immersion of other practices I realised that it could be an interesting methodological exercise to view my practice through the lens of other artists, whose practice I know in some way. This exercise could highlight elements of methodology as well as new perspectives for my own work. Please Note - All interpretations of the work of other artists are subjective. My interpretations are based on conversations with these artists and encounters with their work, but they are all subject to my bias and misunderstanding. These are not explorations of the work of these brilliant artists. Where possible I have linked to their websites, I would definitely encourage having a look. This list of artists is primarily the full-time students (whose work I know to a certain extent) and a few others who I have been able to chat to about their work. Shirley’s work, for the purpose of this exercise, would make me view my work through the speech act, or act itself. I would think about the figure of the artist, and the relationship between viewer and artist in a more representational way. * Pile of canvases that are shaped on one side to form the shape of a person. The other side is left as the natural forms of the pile. Dibble’s work is involved with the haptic experience of materials. If I were to use his perspective to explore my subject and interests I would certainly create sculptures. I would likely focus on the pure materials of painting formed in new ways. * A horizontal plane, with a vertical upright in the centre. On one side (or space - created in the intersection between the two) would be chaos, on the other, order. Representing the space of the work. * A frame cut into pieces and reassembled to create a new form, on which to display the work. I have only seen Deborah’s work as an almost scientific process of exploring materials and their effects, and so, I feel, that through this perspective I would explore the qualities of paint and other mark-making materials with the aim to create an archival installation that presents this exploration to the viewer. Note - The archive was something I explored in the second year of my BA and it is something that has since been an element of influence. Through studying the reality of artistic practice, rather than the assumptions we make, it is clear that there are activities outside the realm of ‘Art’ that artists undertake more than the ‘Art’ itself. The thing taken from Jana’s current work, in this exercise, is the deconstruction and reconstruction of layers within her work. My interest in accidents and incidents would come to the fore here, and I feel I would like to make a piece that layers incidental elements on top of one another. If I were to stick to the parameters of being inspired by another practice then these layers would be trapped in perspex. Layering, without perspex, involves something being hidden, which is something my work has dealt with in more detail. The moment we stretch a canvas we are hiding the wall and the stretcher. Those things upon which the painting relies. Julian's work would encourage me to create a detailed representation of an overlooked object. Which is a very interesting idea, as it's not something I've ever considered for myself. The interesting thing is the reason why; I have always considered the ‘real’ object more powerful than its representation, but this is a bias. This has come to being in the studio in the creation of the piece ‘Reflection’ (2017) which was placed a few weeks ago. I am now forced to wonder if the subconscious influence of Julian's detailed representations encouraged this work. It certainly wasn't a conscious link, but it remains an interesting one. Scott’s close-up abstractions would encourage me to view the individual elements of my work, expanding them where possible. The obvious route would be to take close-up photographs of things like canvas, wood, and paint. (which I began when working with a microscope in 2015) However, I now think the more subtle perspective i could take from Scott’s work would be to explore the close-up detail in a more material way. For example, enlarging the canvas in a sculptural form, reducing details so that a single element becomes the focus. In a way, this links to my placement test for threads of canvas. James’s work is presented in a similar form to mine, and as we share a studio space this is a very exciting development. What I would probably take from his work, if I attempted to use what I know of it to explore my own, would be a focus on representing a single form, or focus, in various ways. Showing the reality of multiple perspectives on the same subject/object. This comes into my practice in the use of canvas in alternative ways. What this exercise has shown me is that there are elements of practice that are already linked through us all. Thinking through and articulating this process has led to some new connections or more appropriately the realisation of existing connections. I can't currently say if this will have an impact on my work in the studio but I believe it will have an impact on my interactions with my fellow artists. As part of the Research Methodology module, we have been part of a lecture series. I have made extensive notes from each lecture, which have not, for the most part, formed pages on this blog. However that they have been influential is impossible to deny. The most influential session was today's, and as a nod to the series as a whole, and this individual session, I'm going to summaries some of the most important points here. Please note - the following writing comes from notes made in the lecture and my own summation and reflection post-lecture. Andrew Southall (2016) Turned Timber. Bromide Print. 50.17 x 58.42 cm. Andrew described his practice through a series of works that have explored the making and creation of pieces of Shaker furniture. The exploration of these works is through a dynamic process of representation and presentation. He describes being driven by a sense of the thing itself and the fleeting nature of that representation. (Southall, 2017) He enjoys the associations that come through the work, including the dynamic between truth and fiction, aesthetics and commercialism, function and purpose. I think that Andrews talk, and particularly his interest in the play of truth and fiction for aesthetic purposes, seem to imply that aesthetics are for consumption. Given my growing interest in the impact of capitalism this is a question that I find very interesting. Andrew describes his practice in terms of an interest in ‘calibration’. Calibrating our experience through imagery. He began to make works that explored the idea of calibration, and different forms of measuring things in life - often things that don’t need measuring. This includes a wonderful piece that measures the weight of a stone (and arbitrary stone, that relates to the English unit of measurement) and defines the weight of that stone as ‘1’. This piece is visually and contextually arresting and reminds me of the subversive language of Amikam Toren. Andrew finds the history of measurements quite fascinating, and admittedly, he has passed that interest onto me. Other works have begun to explore the idea of representation in the present, creating artworks that I want to see in person. These works contain small ‘calibrated’ moments, often employing film and traditional photographic methods, with a unique twist. An interesting point raised through the lecture was the nature of drawing. Andrew presented drawing as a representation of an initial idea (which it often is in the process of artists and makers). Which then shifts drawing as a representation of an original into an interesting dynamic. (Southall, 2017) In Andrew’s case, this is seen in the drawings that he uses as guides to make the pieces of furniture, but this notion has relevance for other uses of drawing. Especially considering my growing inclusion of drawing in my studio practice. From this process, of recreating a piece of furniture from a drawing, Andrew has noted the prevalence of time, as a factor of the research, but also in the process itself. (Southall, 2017) This can be seen as another link, or response, to capitalism, in which we arguably take very little time in the making of things, and far more in the act of choosing them. Once Andrew had finished building the wooden settee he took it to a forest, and photographed it in the landscape, which included the types of trees the wood in the chair came from. Represented in this way, in a picturesque landscape, shows the work in a new perspective. We are more used to thinking about the means of representation as the ‘thing’ that is contemplated, not the landscape itself. (Southall, 2017) This idea relates profoundly to my investigations of the studio and gallery, and the space of display. With a focus on the lived experience Andrews process relies on a process of reproduction and representation, challenging normalised assumptions. We tell ourselves that something is real, and interact with it in ‘real’ ways, however the study of it, and the ‘truth’ of that reality is something far different. Lydia is currently studying her PhD at Bath Spa. She came to speak to us about her practice, which is extremely interesting and i would highly recommend looking into. Her PhD work is ‘An investigation of abandoned places through contemporary painting and mark making’. With more of a focus on mark making as things have progressed. Lydia Halcrow (Unknown) The Black Ground IV. Ink, Graphite and Gesso on OS Map 139. Size unspecified. Dealing with the fleeting nature of memory and the materiality of place, Lydia’s work is creative and conceptually representational. Lydia describes walking as a method of unpicking the reality of an unreliable, changeable, source. Investigating what's under the surface, in place and in memory. She explores the experience of being in the location in line with an exploration of the context of the place. Lydia sometimes includes written records and observations of the walks she takes in layers of the work. Something she mentions wanting to explore in more detail as her PhD continues. For me this re-iterates an idea i have had recently. To add reflections, and potentially some of these blog posts, into the work itself. Probably in pencil. Lydia quotes the grids of John Virtue as a source of inspiration. These are amalgamations of small drawings and paintings that give a snapshot of an ongoing narrative. While walking our attention is in a state of constant shift, this method of presentation works with those ideas. The viewer's eye is drawn around the space in varying ways, and for varying reasons. Like the experience of being in the place, each experience would be slightly different. Mapping is an important part of her practice, including notions of scale. Lydia notes that maps are seen as an accurate representation of information, but that information is tailored, and far from total. (Halcrow, 2017) It is also worth noting that the fact that maps are generally created by humans, or by machines made by humans, adds a layer of fallibility to them. The ‘maps’ made by Lydia are no less important for the difference in information exchanged. Which maps are more accurate? An aerial view, or a more in depth exploration, as we see in her works. Why do we map certain things and not others. Why not map things 1:1. Lydia mentioned a hidden layer in painting, the ghost layer. Which is something i must look into in more detail (Halcrow, 2017). Lydia’s work deals with layers, scale, erasure and multiple viewpoints. Echoes of decay and entropy are evident in the output. She renders clear something that was unnavigable. These are her own series of maps. Time spent in the place develops a familiarity with it. From that familiarity there comes an unfamiliarity, because you look again. In a similar way to the effect of a familiar word over and over again, changing the perceptions of it. Lydia brought up an interesting point and one that fits with my current passions - presence. The more you are present the more you see. She is certainly a processed led artist. Once you answer one question you find many more. Through presence and process, you find more and more, into a nearly endless process. She describes not being fixated on the final object or output but instead allowing the process and materials to shape the nature of the work. The reason I have included this lecture over others was the combination of two lectures describing practices that seemed to fit with the methodology of my own experimentation. Whiting, M. Southall, A. Halcrow, L. (2017) Research Methodology Lecture Series. Bath Spa University. 5th December 2017. This is a question I've been obsessed with for the last few weeks. And I'm going to do my best to keep this concise - I have a prolific practice, it is the way I have worked for the last 5 years and repeated attempts to alter this natural process have met with failure (for various reasons). That is not to say the proclivity hasn't developed, or is in some way detrimental, in fact I think the opposite is true. I've learnt to focus myself, and deepen the research, and with a developed knowledge base I am better equipped to choose new areas of research and deepen those that arouse more interest. In many of the reflective texts, I ramble, but I see these as honest portrayals of thought, and they contain insights that I use to further the practice and formulate new ideas. This blog is already extensive (in word count if not in content) and the list I have planned (which will shorten by increments) adds a fair amount more. However I'm gripped by the platform, I'm enjoying writing, and the fact that I'm creating a repository of searchable information is a brilliant tool for the future. Am I concerned about the word count here? Based on the module I'm working on, yes. Am i going to alter it? No. I'm planning to be aware of the issue, and adjust my ways of working to better suit the process, but I doubt there will be a noticeable change. I get caught up with a subject and before I know it I've written 3000 words. At the moment i'm choosing to see this as a positive. Less than 300 words, I think I deserve a cookie. I'm over a month into the blog, and this seems like a great moment to pause and reflect, a temperature check. I write a lot, I work a lot, I create a lot (if I can use that term, which many theorists would disagree with). This is a fact. I find it very hard to dial this level of interaction back. Whether I should or not is a question that occupies much of my anxious thinking. If I'm honest I feel I've hit a bit of a wall with the research, like I'm going around and around, which I need to remind myself is the point. I need a break for a few days (because for over a month I've been working on context at least once a day, without fail) and regroup. This is an important thing to remember in terms of confusion about whether I'm researching the ‘right’ things. I have regularly paused to reflect on the things I'm researching and I'm noticing the research affecting the ways I think. My reflective journal, voice memos and my writing in the blog itself, all reflect this deepening in knowledge. By far the most interesting factor for me are observations of the ways I am researching, and the similarities between my research practice and studio practice. In the studio, I often create work to explore the ways I make work. In this way, the pieces are incidental to my true focus, an observation of activity. Through this module, I have begun to apply this methodology to my research practice. The blog has encouraged me to date and better record my thoughts and ideas. The practical implications of this is a fuller practice, with fewer lost thoughts. Contextually this has led to an interest in lost moments, incidental thoughts and the development of ideas. Thoughts as art. I'm thinking more about individual thoughts, and having them written (which I didn't always do before this) has led to a deepening of those ideas. I can return to them later and develop them further, or be inspired by them. Using voice memos. I have begun to use voice memo software on my phone to record my thoughts while driving. These are thoughts that would normally be lost. Incidental thoughts. I often don't remember the thought when I listen to it back, there is a chance I wouldn't be able to think them again without the voice memos. One side effect of my level of focus on this module is that I've spent less time thinking about my work. I quickly realised that swapping regularly between research ‘mode’ and studio ‘mode’ was tricky and it was hard to get deep enough into either. So I decided to take a week out of the studio to work on context. That's been a very good idea, and it's been extremely productive. I am now on the Friday evening of the context week, and it's hard to picture what effect this week will have on my studio work next week, but I predict I will be a bit more focused. I have been opening the studio practice up, allowing myself the freedom to experiment (research). I now have a very solid contextual background and have been considering the context of artists whose work is aligned in some way to my own. This can only support the creation of my work in the studio. As Danto suggests, the artwork relies upon the ‘Artworld’ and I am now able to invoke more of the artworld. I'm currently excited about two ideas for next week. The ways we read painting and the notion of balance, both of which have appeared often in the research. We are about halfway through the research methodologies module, and as a temperature check, I’m going to do a quick update on my aims and objectives. Deconstruct canvas, physically and in concept. Comparing the reality of the object with its primary function. Investigate the role of the viewer/onlooker in art. Sub-question - Explore Derrida’s theory of the ‘parergon’ to better understand the concept and purpose of the frame in art and it's implications on the space and interpretation of art. Regarding research, I have been making some progress with these, but this task has encouraged me to think about the ways the subjects I have been researching have (or have not) aligned with my objectives. Figuring this out involved repeated mind-mapping and diagrams. An examination of my keywords as they relate to my objectives. This diagram shows the relation between both and is reassuring that the general direction is covered. Opening my objectives to the main areas of interest. This is a breakdown of planned/begun areas of research and how they fit into my objectives. This is where I started to realise things were a bit more interlinked than I had allowed for. This diagram shows the moment I realised that it is more accurate to say I am not exploring 'art as activity' but 'art as experience' - which came with new issues because art as experience includes the experience of the artist (process) and the experience of the viewer (curation) which led to the next image. Following the last diagram, this one was an attempt to understand the ways I see the areas I am researching, to help me understand how they interconnect. This led to the development of the final diagram. As the large blank section of this diagram shows, I quickly realised this still wasn't quite right. This is the final iteration I created today. I think it shows the way these subjects are interlinked. I have listed main areas of research interest under each heading. It was in this diagram that I realised that in my research the idea of 'the space of art' and 'the experience of art' can be described as the same thing. This diagram, and the route before it, led to the update of my objectives. As the final image shows I have come to realise that my objectives can be grouped into an interest in the physical and metaphysical experience of art in relation to (1) creation and the artists process (2) curation and the viewers experience and (3) the space (or context) that underpins and intersects them both. I believe, and my research is showing, that the three subheadings are so interlinked that they cannot be accurately or truthfully separated. In fact, the act of art itself is a process of bringing the three together into an experience. Through the research of these subjects and a more developed sense of the relationship between the three, I hope the enhance my studio practice and the effective communication of my message. In a blog post on the 31st, i revisited my statement, which fits with this new assessment of my objectives. Statement - “I am an installation artist exploring the nomination of the incidental in art. Working with a subversion of organised activity my work asks questions of temporal perception. What tells us something is a piece of art? The process, the artist, the viewer, the experience or the collaboration of that and more? My practice explores these questions with a combination of found objects and manipulated semiotics. My aims have slightly developed, but I wouldn't say they have changed; more I have articulated them in a more focused way. This change was a natural development of a balance between research and reflection. Going through this process has encouraged me to note what I have researched so far and what I plan to research. The most important factor of this process has been to reduce my planned research. I have been able to highlight a few areas of research that I thought I had to cover and have since realised that I do not need to include; I was being a bit too ambitious, and this reduction is a very positive step. I believe that my objectives are clearer, and although the potential scope of this subject is very large I have been focussing my research more as time passes. I will admit that the scope of this research is one of the areas that I am least comfortable with, in that I am unsure if I am correct that the scope is attainable, I believe it is, and that I have made good progress so far, but it is a very hard thing to check with any degree of certainty. This research is vital to my practice because it is through this research that I am able to develop ideas. The process of my practice is one of concept, and those concepts and ideas often come from art theory, which I then attempt to subvert or challenge through objects and installations in the studio. So I'm 10 posts into the blog and have been finding my keywords shifting and changing with the ongoing research. As a place marker i wanted to revisit those keywords and see how they have shifted. From my perspective, I feel that the keywords have shifted into a more defined realm. Which in itself is extremely useful to my practice. Through the creation and writing of this blog, I have found the activity itself (including the consideration of research methodologies) to be the most valuable, over the research subjects (which have undoubtedly been interesting). Anyone reading this blog from the beginning will quickly realise that I have struggled with articulating this immense subject. My initial narrowing down was somewhat forced, I felt pressured to define a focus but the development of the words has become more organic over the space of a few weeks. We have been encouraged to limit our keywords to 6. The words in brackets are indicators for myself of the area of the keyword that i might be most interesting. These words can all be related to the ways we explore and experience art. In order to connect my practice and research, I've spent some time using the keywords developed through practice into a rough artists statement that describes what I am doing in the studio. This statement will help form questions around these interests and could lead to a further narrowing down of my keywords. While rough, this statement will serve as a foundation going forward. As it is based on viewing my studio practice through my keywords it is quite different in focus to previous statements. Which in itself is an interesting point to note. An answer may be found in a combination of the two, or an acknowledgement of their differences. "I am an installation artist exploring the nomination of the incidental in art. Working with a subversion of organised activity my work asks questions of temporal perception. What tells us something is a piece of art? The process, the artist, the viewer, the experience or the collaboration of that and more? My practice explores these questions with a combination of found objects and manipulated semiotics. Creating conversations through relational aesthetics the viewer is invited to step into the real space of the work to explore juxtapositions of incident and chance against an organised reliance on the interior and exterior of the ‘Artworld’." "I am a conceptual painter and installation artist interested in the nomination of the incidental and unwanted as ‘Art’ using a subversion of traditional media and found objects to form new conversations and relationships between materials, viewer and space. Representing the process of making, and re-presenting that process to the viewer." Previous Keywords - Art, accident, subversion, found objects, viewer, space, process, authorship, experience, nomination, perspective. Next post - not sure yet, I've got quite a few on the go at the moment. This exhibition is currently running at the Royal Academy in London. The show covers the career of Jasper Johns, an American artist whose work has been extremely influential and iconic since the late 1950’s. The show brings together over 150 works, from over seven decades, curated by Dr Roberta Bernstein and Edith Devaney, who worked closely with the artist. This short text hopes to articulate one of the important elements of this exhibition and give an overview of the important observations made when experiencing the work, as opposed to seeing it. Beginning with the iconic image of ‘Target’ the exhibition was arranged chronologically, but each room was a thematic exploration, meaning there were occasionally works shown from different time periods. Each room contained a short text, examining the theme of the room and marking that perspective in the minds of the audience, or at least those who chose to read it. Given the brevity of this text and my potential verbosity on the subject, I am going to focus on a single room – ‘Painting as Object’. The accompanying text explains the artists interest in the objectness of a painting (including stretcher and frame) and the particular interest in pre-existing objects. Many of the works in this room feature objects used in the creation of art, extending to the creation of the painting they are a part of. This inclusion of materials speaks about the nature of process and the reality of a painting as opposed to its illusory qualities. Johns features other objects, notably rulers – an object that directly references the space of the painting, again speaking about illusion and the nature of painting vs the reality of it. Seeing these works in person highlights the importance of this and the mild-hypocrisy of discussing these works without seeing them when their context is in their objecthood. The inclusion of objects into the paintings and the artists' perception that paintings are objects is hard to experience second-hand. Their size, texture, shape, presence, form and meaning is altered when seen first-hand. In particular, the piece ‘painting with two balls’ which is composed of three canvases, hung together to form a single piece. The two top canvases are slightly curved, leaving a gap between the two, into which the artist has placed two painted balls. This piece confronts the viewer directly with the objecthood of the painting. We can see through the canvas to the wall behind, the balls cannot exist without the depth of the frame. It is an extremely successful example of message and aesthetics combining into a pleasing visual narrative. The text links these material inclusions to Duchamp’s readymades and the chance inclusions of the Dadaists. In the documentary ‘Painters Painting’ Johns is interviewed and states that he was not aware of the work of the Dadaists or Duchamp prior to beginning these works, given the artists involvement with this exhibition the text becomes questionable. The retrospective nature of the exhibition of a master manifests in the delivery of this exhibition. The audience is guided through the context of the work, often with explanations or accompanying information. This is in direct contrast to more contemporary galleries in London where the information is contained in a document that the viewer needs to find; even names are excluded in contemporary galleries. These works are already considered masterpieces, and their creator a master. The audience is aware, due to the reputation of the location, the status of the artist and the presentation of context, that these are ‘Artworks’, there is no question of their validity, only how we might perceive it. The primary experience, especially when considering the context, has been singularly important to understanding the works and the potentiality of including objects. John’s message is balanced with an aesthetic skill that is inspirational as well as impressive. Examining the impact of this exhibition on my own practice is not something achievable in 500 words, (in fact the document I have begun to write is already over 2000) which was what I originally planned this document to explore. For me, the important aspect of this task was narrowing down. Which I think I am going to continue to use when forming my future blog posts. I enjoy research, particularly writing, and while it is important that I continue to do it, I need to remember that these posts have an audience, and therefore the word count is an important factor. The audience does not need to read all the research and my thoughts on it, just those I want to share at that particular moment. Jasper Johns: Something Resembling Truth (2017) [Exhibition]. Royal Academy, London. 23 September - 10 December 2017. Marriner, R. (2015) Making and the Contemporary. Bath Spa University. October-December 2015. Painters painting: a candid history of the modern art scene. (1973) [DVD] Emille de Antonio. USA: Arthouse films. Testar, A (2017) Jasper Johns ‘Something Resembling Truth’. [Exhibition catalogue] Royal Academy, London. 23 September - 10 December 2017. The following document is part of one of the tasks given to us during this module. It marks an articulation of my aims and objectives. As discovered through writing the previous few posts – I am an inductive, practice-led researcher and as such the method follows an un-prescribed step-by-step approach. I am most fascinated by the incidental nature of process (meaning process in the studio, process in research or even logistical process) which makes this task quite difficult. The best ideas in my work, and life, have come when I have released control (which I try enormously to hold on too) and I am loath to attempt to unpick things too much or go against a process that works. Simply put – The thread of relevance and focus will be simple to follow retrospectively but is difficult to predict due to the organic nature of the process itself. Having said that this is the most articulate this document has become at the moment. I may revisit this text in a later post, mid-research. The objectives align to the diagrams in the previous post, but are not ruled by them. My interest lies in the incidental process in art and the nomination and understanding of art and the space it occupies. By investigating traditional ‘rules’, processes and materials I aim to identify elements that can be practically subverted or skewed to encourage new conversations between material, viewer and space. I plan to adopt a methodical objectivist approach to literary research combined with practical investigations into the ontological reality of artistic practice, forming a inductive, bifurcated method. I am a practice-led researcher and practitioner. With a methodical deconstruction of ideas, I aim to explore our understanding, and perception of art. Deconstruct canvas, physically and in concept. Comparing the reality of the object with it's primary function. Investigate the notion of nomination as process. Next post - Time to get down to some actual research, rather than just thinking about thinking! Next post is Derrida, and his theories about the frame. Welcome to the most image heavy blog post I think im going to have. My mind maps have come through in a few stages. Through creating these maps, and attempting to identify my aims and objectives, I have realised what my methodology is, in its most practical terms. To pin down my aims and objectives, i have to first look at my methodology as it has exsisted to date. I am an organised and slightly obsessive personality, i work using a practice-led method with often reactive explorations. This is true of both my studio practice and my research. For example, during my degree, I began research by mind-mapping keywords and known associated artists. This initial deconstruction led the research, which then focussed as the research progressed and a true interest arose. This approach does not lend itself well to an initial question or much specificity, instead following an organic and intuitive focus to a defined end. I find myself unable to currently define exactly what I am going to bring together, but through doing (as in the studio, with writing, with looking at a thick book, or even getting out of bed in the morning…..) I find the only solution for me is to begin. An interesting point that I have to note now. The penultimate paragraph in the last post was an exposition of my methodology in technical terms, with the help of a book and a very descriptive table. Whereas the paragraph above is the practical description, based on a discussion with my husband about the ways I work, and time spent staring at this document. Deductive vs inductive exploration of the same thing. It would be an interesting exercise to explore whether the two are actually saying the same things, and if not the differences could be fascinating. I started with the broadest view of my studio practice, and its contextual links. These images are complicated, and far too inclusive and undefined. I next created a mind map based on the keywords highlighted in our initial weeks of the MA. This deconstruction remains too undefined yet somehow restrictive. I tried a few different ways of categorising the artists, subjects and texts. It's hard to say whether these are useful at the moment but they are a form of data collection. The final iteration of my mind maps, for now at least, removes the majority of the lines. I felt like those connections had become too numerous and convoluted. The images are too hard to read and decipher. This mind map contains a few lines - where connections needed to be made explicit. The format of this map is based on the location of artists/texts/words to each other. I feel that this map is far more indicative of my practice, and is something i can use as i continue forward as a foundation for where i am, where i might be soon and where i might find areas of interest. An initial deconstruction of this map found three primary 'areas', although this is only an initial, and almost intuitive, deconstruction. I have tentatively titled these areas 'process', 'context' and 'material'. I then challenged myself to choose the most important elements. I began redacting this copy, before quite quickly realising that it was redundant. These things are all important in some way, however this drew me to an important realisation - some of these things have moved into the realm of inspiration as opposed to objective. To further understand this development of research done over time i deconstructed the above information into a chronological catalogue of interests and context over the last three years, and potentially the next. This iteration has been the most useful for organising my thoughts and where i might want to begin researching this year. While some of the subjects have lasted through the years, the focus has certainly narrowed. With the combination of the two i believe i have a far more solid foundation of what i am interested in and where potential areas of research lay. While all of the information in level 1 is relevant in some way it is not where my objectives may lie. I found the distinction between what has become an influence (by dint of previous research) and my objectives to be an important one. Taking the words most associated with my current practice (far right coloumn on the previous image) the next image attempts to locate those words in practical terms - where they intersect with my practice. The colours were then added to organise/simplify by 'subject'. The list in the top centre of the image shows the three words for each of the three 'subjects'. This transitory document was extremely useful in trying to deconstruct what i consider to be the most important elements of my current artistic practice. Re-presenting the above information led to this iteration, which is a redacted (more workable) version of level 1. The information is not really any different, but the perspective is. This final level, categorised for now into three sections, shows a true deconstruction of interests and aims. Ive highlighted a few areas of research interest (in yellow), one or more of these elements will make up the coming research posts. The image speaks for itself. The process of deconstruction has been difficult, confusing and generally overwhelming, but, as i think this final image shows, productive. I have a far clearer idea of where i am, and where i might want to be. Next post - a short document articulating my aims and objectives in the most definitive terms I can identify now. Far more confident thanks to these mind maps. In the previous post I explored a few of the methods that might be used. This post discusses methodology in fuller terms. A foundation, a marking of where I am, before the full research begins. We have had a suggestion that the exploration of our tacit understanding is important at this point. Meaning that it is important to use information we already know and have explored, which is logistically harder to condense into a bibliography. We’ll begin with this diagram again, which i need to be able to answer to get to my sources of research. Who we are as researchers forms methodology, but this is broken down into the reality we are looking at (ontology) the questions we ask (epistemology, and ontology) the lens we are looking through (theoretical perspective), the worldview (paradigm) and our tools (methods). The epistemological and ontological concerns will arise in direct response to the research being done and aren't necessarily questions to be answered now. However, understanding my theoretical perspective is something I can certainly begin to unpick. One of the first questions I should cover relates to my aims and objectives. Which brings me to the distinction between inductive vs deductive research. Research is the gaining of knowledge in some way, and there are many practical applications and areas of research, many that we don't acknowledge as such. Deductive research can be described as research where the question or theory is known and tested, whereas inductive can be described as generating new information from an exploration of subjects, materials or processes. I see this as the division between knowing the question you are asking and trying to figure it out through process - which is a very big part of many artists studios, including mine. In terms of placing myself, I would say that I am an inductive worker, although in research I lean more towards deductive at times. The previous post deals with the definition of these terms, but a moment should be taken to explore them on a personal level. I am, as are many artists, a qualitative researcher (tacit knowledge, with an emphasis on value) although at times I use quantitative methods (occasionally subconsciously) to help move my practice. In future, if I continue the blog as I expect to, I may come back to explore research i have done to date. If i hope to underpin my practice in its entirelty this seems to be something I will need to do. However, for the purposes of a module of the MA, that backgrounding is not going to be possible now. I know these things, they have shaped my practice to date and i have notebooks filled with information, annotated texts and diagrams, to solidify and support my practice. I may refer to this information in this blog, where I do I plan to reference the information as much as possible. The information has been assimilated, to a certain extent, and I may assume in places (I hope to control this). The urge to quantify the research to date, is strong, but this blog is not a definition of my practice, but instead serves as a record and research tool in my ongoing research. In the simplest terms, I aim to develop my contextual knowledge to enrich the work being done in the studio. In addition, I hope to gain an understanding of the balance of research within the practice itself. The haptic nature of explorations in the studio. I have a broad range of interests, especially when we take into account the depth that can be found in a single material, for example. Any aspect of the practice, materials or context could, with a little research, become a vast exploration. For now, we have been advised to look at the practice, and it's associations, in broader terms. A focused subject will be chosen quite soon but for now, my objectives centre around expanding the terms around my practice and mapping their connections. I'm not going to go into this with more detail today. There will be a post in the next week detailing a better-defined series of aims and objectives. One thing I can say about my methodology since starting this blog is that writing is at the heart of it. At the beginning of each post my knowledge is like the page, rather empty, but through the writing, I have to articulate, and that is impossible without understanding, which leads to research and often an hour writing a single paragraph. Trying to explain these terms, and ideas helps to understand them, which explains the bulging context folders I was known for producing during my BA. Through reflection on the practical practice of research, I've come to acknowledge that this is something I have always done when researching. A very practical approach. As an artist, I have a practice-led perspective, where my interests are led by the work being done in the studio. I research something because it has potential impact or impetus, which is worth stating. Paul Minot, a senior lecturer at Bath Spa, gave a wonderful lecture this week about the practical realities of a practice-led approach, and the way the outcome of the research might be formed, which is not always as simple as it appears. “Research – means to search for something in a systematic way. “ Re-search. The paradox of research is: 1/ if you know what you're looking for, whats the point of looking for it? How will you find anything ‘new’? 2/ If you don’t know what you're looking for how will you know when you’ve found it? In other words – if a theory exists whats the point in re-stating it? And, how do you know if there is a theory at all? ‘Anamnesis’ – a philosophical idea (from Plato) that suggests that we already ‘know’ everything but we just haven’t recalled it yet. Making recollection an approach to research, which can be interpreted to mean, that research is best driven by instinct. What we should be taking from this is the importance of instinct. We should go with what we know. We are artists and that has an impact on the way we research as well as the subject. Sometimes the theory comes after the content. The important thing to remember at this point, and taken from the lecture, is that the form the research takes and the outcome occupies are not as obvious as it would first appear. Trying to pin down a single paradigm that defines or exemplifies my stance seems an enormous task, and I could well be confusing the issue. Reading it made me realise I missed my paradigm by being too involved in it, to me the paradigm is obvious. During research it is singularly important to question our assumptions. With an interesting similarity to the development of the art world, the methodology of science remained mostly unchanged for 300 years, following the positivist paradigm, which can be defined as a distance approach, with an emphasis on fact, empirical evidence and a removal of value associations. Following that came the post-positivist paradigm, which challenged traditional notions and expanded the field. The above table articulates, in a way that i currently cannot, the definition and examples of what a paradigm is, and how we might understand it to better understand our research. Defining my theoretical perspective involves discussing my approach, which is firmly in the practice-led column. Through writing this post i have better come to understand what those words mean, in practical terms, and have built my perspective without realising it. This is something I'm going to be coming back to in the coming months, as the methodology is put into practice. I am coming from the perspective of an practice-led artist, meaning i am most likely to use a mixed method approach, as this is remarkably similar to my studio practice - no single medium, theory or visual subject defines the work definitively, there are always overlaps. The thing i have found most interesting about this term (covered on page 74 of ‘Visualising Research’) is that the form the research takes when presented is often a bricoleur, the method becomes the work. Next post - mind maps….. Brewer, J. and Hunter, A. (1989) Multimethod research: A synthesis of styles. Newbury Park, CA: Sage. Gray, G. and Malins, J. (2004) Visualising research. Oxon: Routledge. Minot, P. (2017) Research methodologies week 3. Research Methodologies module, MA program 2017/18. Bath Spa. 10th October 2017. Whiting, M. (2017) Research methodologies week 3. Research Methodologies module, MA program 2017/18. Bath Spa. 10th October 2017. I have a few books on research on hold in the library, the MA cohort at Bath Spa is keen and the wait might be a few weeks. In the interim I've found a few great sources of information online and I'm going to attempt to use some of the methods introduced on Tuesday to explore a few ideas. Before getting into the meat of what I’m going to research, I thought it might be a good idea to have a firmer grasp of the how. '-ology' means there has been a debate or study. So in Methodology there has been a discussion and study about the methods themselves. Decisions made. Arguments defended. (How you completed the study.) These decisions add up to your approach – the outcome of your methodology or your methodological considerations. Different approaches can form different results, especially when the methodology isn’t understood. There are things that can affect the results of research we are doing that are assumed to be true or false. Those assumptions can refute the data/information if not explored and accounted for. Exploring the methodology can allow an understanding of those assumptions and an incorporation of them into the research. A research method is a tool or structure used to explore the research. They are usually explainable (to an extent) and I struggled to find an exhaustive list of them, as their inclusion can be as subjective as their processes. Roughly put; it is the way the research happens. Data gathering, and the forms it takes. Three methods have struck me as being interesting for my own research at this stage (although I may end up using others later) and I have arguably been using these in some form in my research to date, albeit unknowingly and in an incomplete sense. Haptic (primarily involving touch, and the physical interaction with the subject) in hindsight I can say that this is a common research method in the studio, which is a place for the haptic. Objectivism (Seeing the reality of the object in its component parts, and understanding the object to take it further) this logical approach seems like something I would enjoy and echoes the Derridian theory of deconstruction, which I use as a source of inspiration when none is readily available. and, Semiotic (concerning the relationship between image and meaning. Communication through recognised signs and symbols) which I've always found as interesting as language - both are agreed upon constructs that we use in daily life, often without being consciously aware of it. As an exercise I’m going to use these three methods to understand how we might explore different elements of research. There are far more topics, subjects and ‘things’ that could be explored like this, but this is a short exercise to help me understand the terms and the, potential, practical uses of them. Before continuing to the exploration, I’m going to solidify my understanding of a few words and terms. Ones that might come up again. Not methods in themselves these words are more concerned with the theoretical perspective and understanding the type of questions being asked. Epistemology is the way we know things, about the understanding of knowledge and the methods of finding it, primarily useful to understand the biases and perspectives when researching. The –ology of knowledge. Ontology is about the reality of the thing being studied, relating to the question “what is it?” and personally most often in my life this is a practical research method. Note – Epistemology comes from the Greek for ‘knowledge’ and ontology from the Greek for ‘being’ or ‘to be’. Plato saw a difference between ‘episteme’ (knowledge worth knowing) and ‘doxa’ (everyday knowledge). Interestingly when thinking about the entemology of these words I found myself interested in the balance between the two. If we take the everyday knowledge as implicit knowledge, or knowledge that goes without saying, then an argument can be made that my studio practice is an exploration of the doxa of artistic practice. If those assumptions can be taken as true then it is arguable that once we focus on doxa it becomes episteme. Many artists take this approach in a practical sense, using the everyday to explore deeper ideas. These terms are associated with the nature of the research being done. In the most simplistic terms the distinction is set upon the balance between tacit (qualitative) and explicit (quantitative) data. The two overlap in many ways and we can make them overlap in more by directing primary research. The suitability of each is related to the aims and objectives of the research, as well as the availability of data. A dense subject, and one I cannot profess at this stage to completely understand, but for the purpose of this exploration, semiotics, as used here, can be described in the following way. Semiotics gained popularity towards the late 1960’s and two key figures are Roland Barthes (particularly his collected essays Mythologies, which I am planning to discuss in a separate post) and Ferdinand de Saussure (generally considered a pioneer of linguistics and semiotics itself). A study of tacit and explicit signs experienced in daily life with other humans. These signs can be the obvious functional signs found in our lives, but are more commonly the subconscious and more subjective interpretation of information found around us. The location of these signs is seemingly only limited to where a researcher might look. The sign can be dissected into two parts, as defined by Saussure, the ‘signifier’ and the ‘signified’. The signifier is the form of the sign (often the physical form of it), and the signified is the concept we understand it to represent. The sign is the combination, and relationship between the two. A single signifier can have different meanings, when seen in different locations, which is a simple example of how this complicated subject becomes much more so in practice. By definition semiotics is subjective, an interpretive method. Umberto Eco has taken it to it’s most basic “semiotics is concerned with everything that can be taken as a sign” which could arguably be anything. The following exploration is short in places, and longer in others. It is far from complete but instead served as a chance for me to attempt to unpick these ideas and see what they might look like. These are subjective interpretations, based on my knowledge, perspective and research. I found that the objectivist method, involving treating the subject objectively, listing its details and understanding its parts to know it further, most accurately described the subject, so those are listed first to understand the reality of what we are looking at. Objectivist - This piece is part of a larger series of works called the ‘Working Surfaces’ series. Canvases are placed in functional studio or workshop spaces and left to record the evidence of making and process. The resulting paintings are then stretched, functional canvas, nominated as art. This piece spent nearly three months covering the worktop in the paint workshop at Sion Hill. Other than myself and the paint technician the purpose and eventual use of this canvas as art was unknown. They are intentionally misleading, pretending to be something they are not, but in the act of pretending they become it anyway; Art. They can be said to simultaneously reject and celebrate the artists’ ego, and therefore the artist themselves. The division of labor and deskilling question the value of these as artworks. The titles of these works are taken from an element on the surface on them, a further dissociation from the artist. They objectify time. A record of a period in an artist’s studio, containing a variety of signatures, they are naturally narrative and unintentionally expressive objects. As an object this piece is 144 x 99 x 3cm’s in size, the canvas is not totally taught on the stretcher (a result of stretching something used functionally is sometimes a loosening of the weave) and is made of canvas, pen, acrylic and oil paint, primers and other substances used in the creation or experimentation of art. Haptic - in the first sense the haptic experience of this work is rooted in the texture of the surface. With no change from functional worktop to stretched canvas the surface is covered in dust, paint, glue and pen marks. The piece looks rough and real. Semiotic - there are a few obvious symbols on the surface of the piece. Including the titular graffiti, a sketch of a design and other numbers and words. The graffiti is obvious as such due to the time taken to write it (which we can see evidence in the depth and width of the pen marks). Fainter notes indicate working through an idea, a rough note taken quickly to visually understand it. Including the diagrams these are marks of explanation, a communication of an idea that is paused for a moment in this surface. Other visual signs are condensed in the bottom right corner of the piece, paint and other substances that show the edges of other works created on top of them. The marks, the right angles and jagged brushstrokes, are a sign that we can interpret to show where work once sat, because these marks are incidental they are all signs of other activity, and can be read semiotically. In this case the methods show very different elements of the work. Marcel Duchamp (1917, replica 1964) Fountain. Porcelain. 36 x 48 x 61 cm. Objectivist - looking at this piece objectively is relatively easy. The purpose of this work is to encourage these questions. Created 100 years ago the piece was Duchamp’s first readymade - A series of everyday objects, transformed into art through nomination, readymades are defined not by their aesthetic qualities but their conceptual ideology. Characterised by their lack of interaction from the artist these objects inspired challenge. The challenge was implicit, although not necessarily totally intentional. This piece was a shop bought urinal, with a single interaction from the artist, the name ‘R Mutt’ and the year roughly drawn on the side. Objectively the object is mostly, unchanged, but through the nomination of it as art, and the subsequent change in perspective, the perceptions and purpose was forever altered. Haptic - I saw this piece at the Tate Modern earlier this year. The haptic experience in this case has similar observations to the objectivist method. When looking at the work I was struck by the reality of it. The curves of the porcelain and the weight of it cannot be conveyed through an image. (although the weight was obviously based on a visual examination and intuitive feeling) Given that the object is arguably the point of Duchamp's readymades this piece shows the importance of the haptic method of examination. Semiotic - The biggest sign of this piece is the fact that it is a urinal. We read the shape, material and cultural understanding of the object and read it as something we would normally find in a men’s bathroom. Again I find that this method perfectly describes the ideology of the work. It is in reading the ordinary object as art that we understand the work. The semiotic meaning of the writing is far more debatable. Duchamp was known for misleading information, but is quoted as saying himself that it was a humorous allude to the makers of the urinal, a newspaper cartoon and a play on the idea of poverty. Each of the approaches in this case yield similar results, possibly due to the simplicity of the object and idea. Each however shows a different element of the whole. Objectivist - Jacques Derrida was a French philosopher best known for his theories on deconstruction. In his 1978 text, The Truth in Painting he discussed the frame, coining the term parergon, to explain why when looking at the work the frame is part of the wall, and yet when looking at the wall it is part of the work. Refused by each to be considered as part of themselves the frame exists between the two, as a separate entity. Derrida said about the parergon, “neither inside nor outside, neither above nor below, it disconcerts any opposition but does not remain indeterminate and it gives rise to the work.” The function of the parergon, then, is to create a framework that contextualises (and re-contextualises) what is being framed. The parergon is both a literal framing or placement and a metaphysical concept that denotes context. Haptic - this is the main reason I wanted to undertake this exploration. To understand, or at least articulate, how we might explore a theoretical concept, haptically. Upon reflection, and quite a few deleted paragraphs I can only conclude that the exploration of this concept haptically is what I am exploring in my studio practice. Haptic research as practice. Semiotic - The semiotic reading of this theory seems to relate to our understanding of the purpose of a frame. We have a way of reading something in a frame, and there are artists who have taken this often subconscious reading to their advantage. A frame can be seen as an instruction to look through the lens of art. Exploring a theory certainly seems to be simplest when done with a quantitative method, like the objectivist interpretation here, at least verbally. This section has taken the longest to write, while being quite short, but has had the most impact on me. 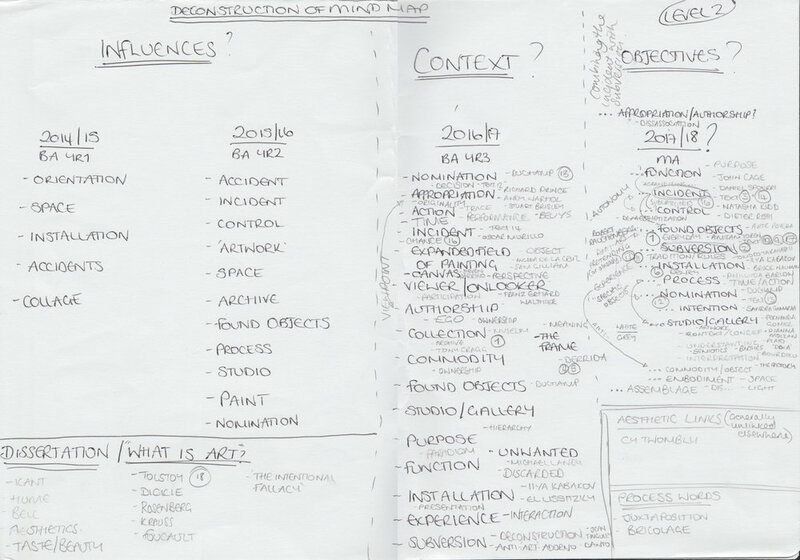 My contextual research to date, including my dissertation from last year, has been similar to this, a deductive objective exploration of theories and artists, which has then been combined with an intuitive haptic method of research in my studio practice. At the end of this post I've solidified my understanding of the purpose and potential uses of three methods, and I can see the benefit of looking through different methods, to get a more solid grounding about the chosen subject. For future research I plan to use the three used here to research in a similar way, or at least to ask myself “How would I describe or explore this objectively, haptically, and semiotically?” noting the different answers from the different methods. In the next post - I'm planning to attempt to unpick my theoretical perspective, understand the paradigm and answer a few questions about my own research methodology at the beginning of this exploration. Camfield, W A. (1987) ‘Marcel Duchamp's Fountain: Its History and Aesthetics in the Context of 1917.’ Dada/Surrealism (16): 64-94. Derrida, J. (1978) The truth in painting. Chicago: University of Chicago Press. Tate (January, 2017) Fountain, Marcel Duchamp [Exhibition visit] London: Tate Britain. Tate (undated) Marcel Duchamp: Fountain, 1917 [Online] Tate. Available from: http://www.tate.org.uk/art/artworks/duchamp-fountain-t07573 [Accessed 07.10.17]. Tompkins, C. (2013) Marcel Duchamp: The afternoon interviews. Brooklyn: Badlands Unlimited. Research Methodologies - a term encompassing the way we research, as well as what we research. The first written project of the MA is an explorative research module that encourages us to direct and expand that usually solitary activity. This blog will record elements of my research beginning this year. This initial post will cover a brief introduction to the methods I might be following in the coming months, notes from an initial lecture yesterday, by Dr Michele Whiting at Bath Spa University. Knowledge is more than just facts, it combines background assumption, arguments in the field, theories and informing ideas. Knowledge is information, or a set of understandings, organised into a meaningful whole. Learning new information puts you at the edge of your knowledge which can be an uncomfortable place. Everything we do in life is rooted in theory, whether we consciously explore it or not. Interestingly this idea relates strongly with my dissertation last year, and the experience and interpretation of art itself. Understanding this complex web of context is a matter of asking questions, and understanding viewpoints. When we ask questions of something we can begin to know its limitations and benefits. As researchers, understanding how we ask those questions (the position we take as researcher) is important. There are two types of knowledge; that which is tacit, which can be described as being difficult to put into words, knowledge that is intrinsically felt or embedded. Its mirror is explicit knowledge, that which is formal and codified, for example academic texts, specifications, instructions. Explicit knowledge can be readily transmitted to others. Epistemology - A theory of knowledge. Can be described as knowledge accrued by professionals. Value, worth, literature. From the Oxford dictionary - "The theory of knowledge, especially with regard to its methods, validity, and scope, and the distinction between justified belief and opinion." Ontology - Can be described as the nature of being of the 'thing' in question. The real world questions of it. From the Oxford dictionary - " The branch of metaphysics dealing with the nature of being." Theoretical perspective - This is the position of the person asking the questions. The stance or lens that informs the methodology. Methodology - The study itself, what strategies, plans, processes or design inform the research. Haptic - a method of primary research involving touch and our physical experience. Relies upon a physical manifestation. Proprioception - the awareness of something in relation to your body. Heuristic - a method of research enabling someone to discover or learn something for themselves. Hands-on or interactive approach to learning. Phenomenology - Consciousness and the objects of direct experience. The study of things and the nature of being. Using object as a starting point, but then using the art practice to aesthetically express it beyond its basic expression. Our experience. Immersion. Semiotic - Communication through visual signs and symbols. Tacit and explicit. Making subconscious understanding explicit. The relationship between image and meaning. The interpretation of the image and meaning applied. The manipulation of the audience through semiotics. Objectivism - removing emotion from the situation. Everything becomes an object. Term coined by William Williams – emphasis placed on viewing the thing in a different way. Analysed in terms of its mechanical features, how it was constructed. A way of clarifying something we have trouble defining or is nebulous, so we can break it down to its core components, which can then be taken further. Quantitative - relating to, measuring, or measured by the quantity of something rather than its quality. Quantitive data. Qualitative - relating to, measuring, or measured by the quality of something rather than its quantity. Thinking outside the box, the quality of the object rather than meaning. Paradigm - The world view of what we are looking at. Can help tell us what lens we are looking through. The paradigm isn't the lens but knowing it can help understand what end it is. Keywords - Art, accident, subversion, found objects, viewer, space, process, authorship, experience, nomination, perspective. Statement - I am a conceptual painter and installation artist interested in the nomination of the incidental and unwanted as ‘Art’ using a subversion of traditional media and found objects to form new conversations and relationships between materials, viewer and space. Representing the process of making, and re-presenting that process to the viewer. The next post(s) will be a few mind maps and initial explorations into the themes of my practice and an unpinning of some of the theories and artists at the centre of its context. Ally McGinn (2017) A Question in Painting [Installation detail]. Mixed media. Size varies.